Macabeu is a white wine grape varietal most commonly connected with Spain. In the north-east Catalan region it is also known as 'Viura' and 'Macabeo’ and in Roussillon area is also known as ‘Malvoisie’. The grape is predominantly used to make youthful white wines with sharp acidity, ideal for early consumption or blending with other varietals, Grenache Blanc or Gris in Roussillon. Wines from the Macabeu are dry, lifted acidity, and have notes of delicate wildflowers and bitter almonds. Macabeu can be subject to barrel fermentation and extensive lees handling, and subsequently developing wines with a tight, lemony palate. Conversely, under the guidance of traditional techniques it can undergo extended ageing in neutral wood, bringing an oxidative complexity and appealing texture. 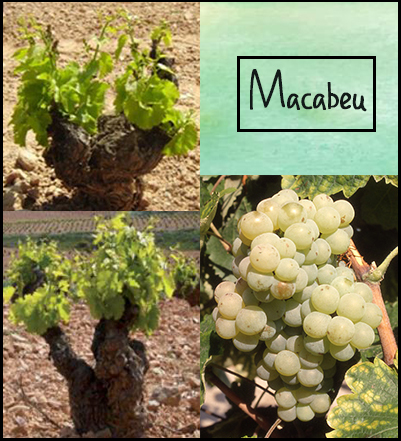 Macabeu is a sturdy and vigorous white skinned grape varietal that is particularly well suited to warm Mediterranean climates. Macabeu also conveniently buds late which makes it less likely to be harmed by frost. Although prone to rot, the dry regions in which the grape successfully grows, seldom suffer fungal disease issues.